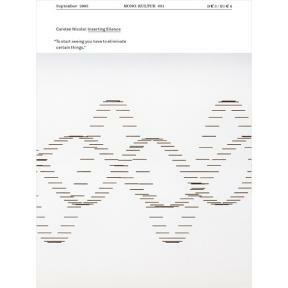 The very first issue of mono.kultur is dedicated to German musician and artist Carsten Nicolai aka alva noto. Nicolai is renowned for channelling his interests in science, mathematics and natural phenomena into different outlets, notably highly aesthetic and compelling works of art and installations which have been exhibited at major institutions such as the Guggenheim New York or the documenta X. However, his experiments with frequencies and sound have also resulted in a prolific career as a musician under the moniker of alva noto, while co-founding the acclaimed record label raster-noton dedicated to pioneering new ground in experimental electronic sound. With mono.kultur, Carsten Nicolai talked about his beginnings during the end of the Communist regime in East Germany, the use of error in his work and how grids and patterns can explain the world. This issue not only showcases a range of Nicolai’s body of artwork, but also honours the silence of erased interview passages with empty space.